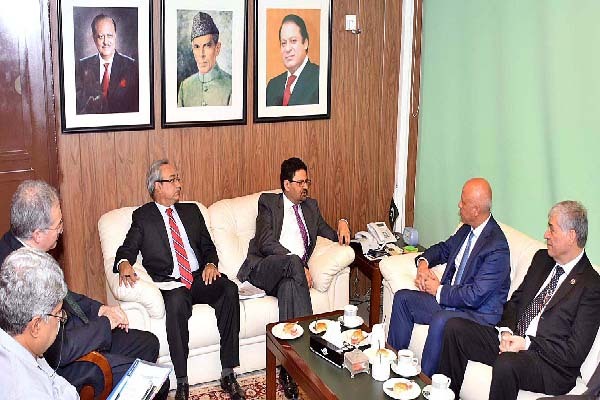 ISLAMABAD, Aug 24 (APP): Minister of State/Chairman, Board of Investment (BOI) Dr. Miftah Ismail here on Wednesday informed a Turkish delegation that the government was encouraging the private sector for setting up industries in Pakistan. The Special Economic Zones (SEZ) has been established to meet the global challenges of competitiveness to attract Foreign Direct Investment (FDI). Dr. Miftah Ismail told the delegation that the law allows creating industrial cluster with liberal incentives, infrastructure, investor facilitation services to enhance productivity and reduce cost of doing business for economic development and poverty reduction. Pakistan offers to establish Special Economic Zones which provide 10 years tax holiday for investors and the developers with duty free import of plant and machinery. and five years thereafter for SEZ Zone enterprises. energy, power, LNG, dairy products & live stock for Turkey investment in Pakistan. largest industrial and services group in terms of revenues, exports, taxes paid, share in Borsa Istanbul’s market capitalization and employment generation. At the end Dr. Miftah Ismail, Minister of State/Chairman, BOI thanked Mr. Levent Cakiroglu, CEO, KOC Holding, Turkey and his delegation, and appreciated their efforts and intention to boost investment, trade and economic relation between the two friendly countries. The Chairman, BOI assured them for BOI fully support as and when needed. Investment and met with Minister of State/Chairman, Board of Investment (BOI) Dr. Miftah Ismail and its Secretary Azahr Ali Chaudhary.